Sorry to keep you waiting. We updated La-Mulana since the game was released on Steam. 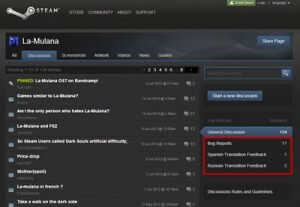 Most fixed points are connected with Steam version and that achievements. We were helped a lot by pointing the mistake of Russian on Steam community. 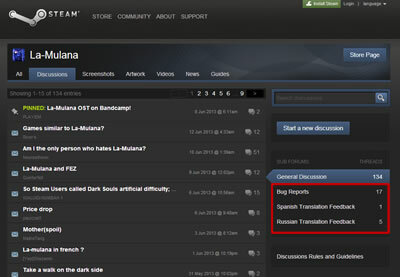 Because, we fixed other minor bugs, purchasers will be able to download new version of Playism and GOG soon. At the earliest Steam version will be updated shortly. We wish we could release La-Mulana on every consumer platforms, too! But, let us make La-Mulana2 first, and La-Mulana EX for VITA will be available in early next year. As I’ve said earlier – it would’ve been real nice to get the full English script to do the full Russian re-translation, because the current one is absolutely horrible and seems to have been done by Google Translate:(. I’d geniunly do it completely for free myself because La-Mulana is amazing and needs to be known better in russian-speaking territories:) Font needs to be changed too, it looks ugly and much bigger than English and Japanese. I have not seen LA-MULANA on Kickstarter. Did you decide not to do it? Oh i see you are paying attention to the international releases, in that case ill check the spanish translation. Also are you guys planning on adding Steam Trading Cards?